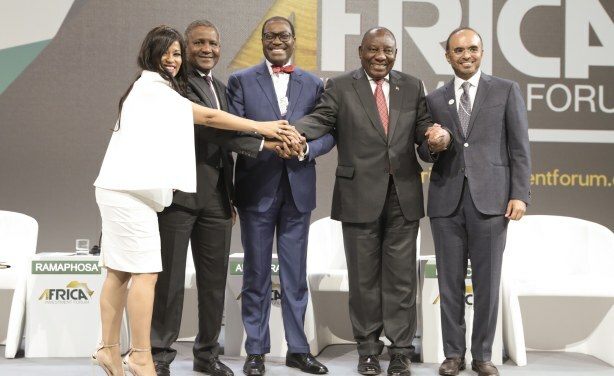 The African Development Bank's Africa Investment Forum (AIF), which took place in Johannesburg November 7-9, 2018, has ended on a high note. Lauded as "a game changer for financing Africa's infrastructure development," the forum will focus on structuring deals, screening and enhancing projects, attracting co-investors, and facilitating transactions to unlock Africa's multi-billion dollar investment opportunities. 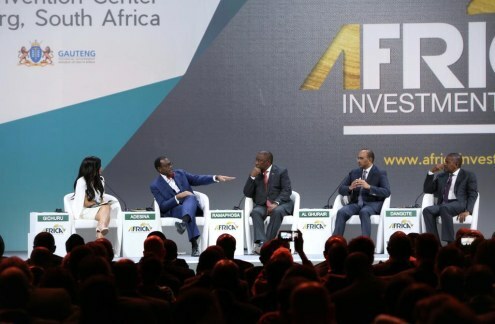 Center piece for the Forum is the #AfricaInvestmentForum is the transactional marketplace dedicated to accelerating Africa's investment opportunities. 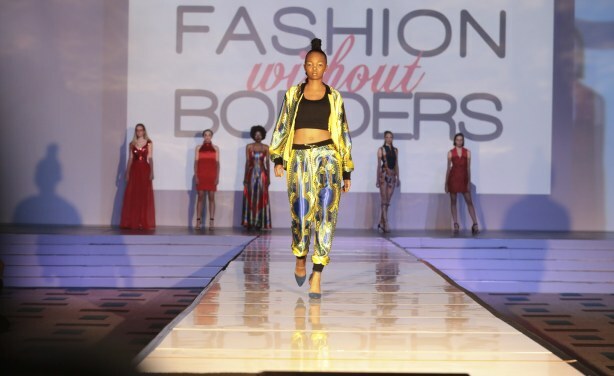 An evening reception showcasing the multi-billion dollar African creative industries with a focus on fashion and music. 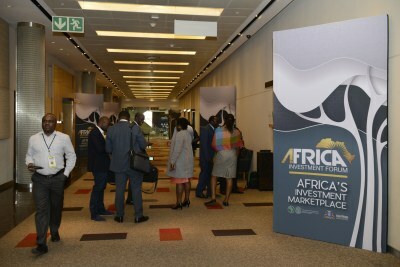 The reception took place during the Africa Investment Forum at the Sandton Convention Centre in Johannesburg from 7-9 November, 2018. 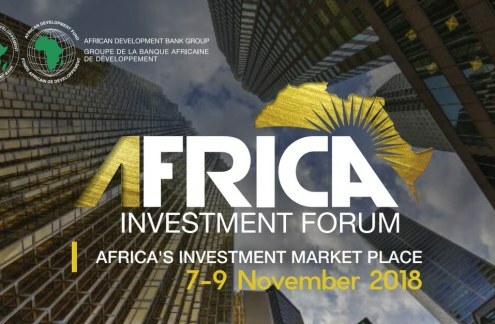 Day 3 - of the Africa Investment Forum at the Sandton Convention Centre in Johannesburg from 7-9 November, 2018. 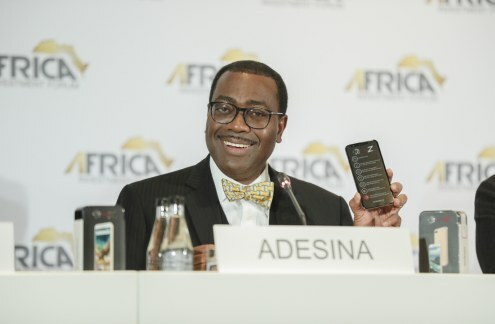 (L - R) : Victor Oladokun, director, communication and external relations African Development Bank; Akin Adesina, president African Development Bank and Ashish​ Thakkar, founder of Mara Group at the announcement of the production of the Maraphone – the first made-in-Africa, full-scale smartphone, soon to be manufactured in plants across Africa by the Mara corporation. DAY 3. 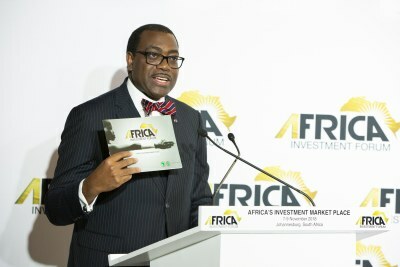 President of the African Development Bank, Akin Adesina, at the press conference for the announcement of the Maraphone. 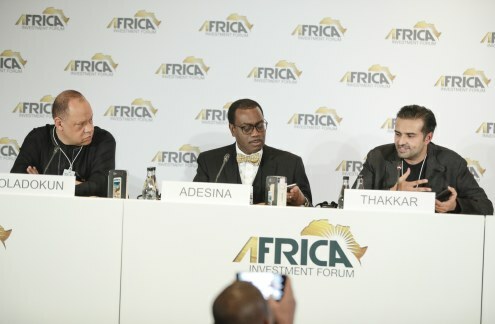 Ashish​ Thakkar, founder of Mara Group, announced the production of the made-in-Africa, full-scale smartphone on the final day of the Africa Investment Forum in Johannesburg, South Africa. 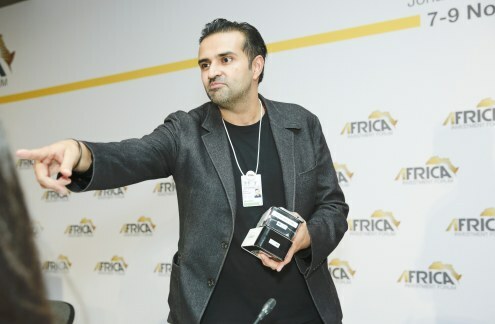 Ashish​ Thakkar, founder of Mara Group, announced the production of the Maraphone – the first made-in-Africa, full-scale smartphone, soon to be manufactured in plants across Africa by the Mara corporation. 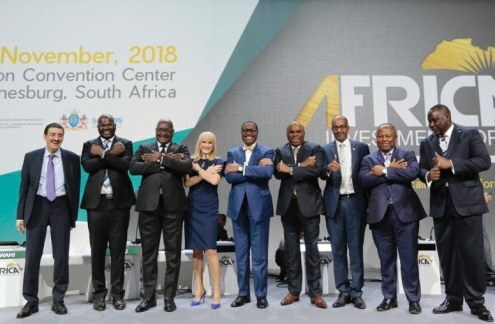 The announcement was made during the Africa Investment Forum at the Sandton Convention Centre in Johannesburg from 7-9 November, 2018. Day 2 of the Africa Investment Forum at the Sandton Convention Centre in Johannesburg from 7-9 November, 2018. 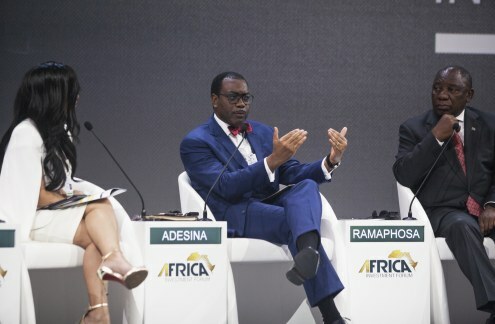 (L - R) Julie Gichuru, Founder and CEO, Arimus Media Limited (moderator); Aliko Dangote, Chairman and CEO, Dangote Group; Dr. Akinwumi A. Adesina, President, African Development Bank; H.E. Cyril Ramaphosa, President of the Republic of South Africa; Sultan Ahmed bin Sulayem, Group Chairman and CEO, Dubai Port World. Day 2 of the Africa Investment Forum taking place at the Sandton Convention Centre in Johannesburg from 7-9 November, 2018. 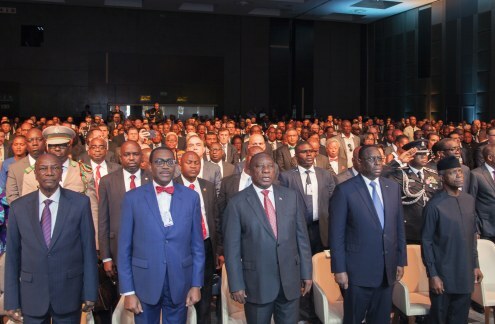 Dignitaries attending the opening plenary include president of Guinea, Alpha Condé; president of the African Development Bank, Dr Akin Adesina; president of South Africa, Cyril Ramaphosa; president of Senegal, Macky Sall; vice president of Nigeria, Yemi Osinbajo. 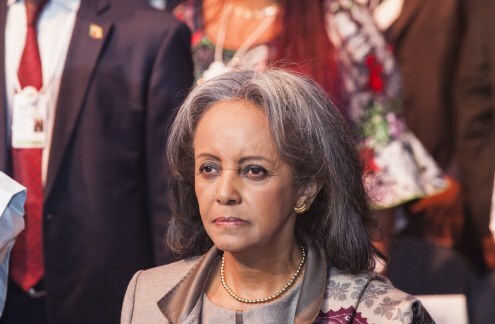 President of Ethiopia Sahle-Work Zewde attending the Day 2 opening plenary of the Africa Investment Forum taking place at the Sandton Convention Centre in Johannesburg from 7-9 November, 2018. 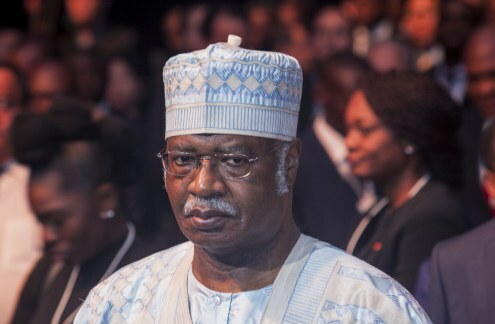 Prime minister of Cameroon Philémon Yang attending the Day 2 opening plenary of the Africa Investment Forum taking place at the Sandton Convention Centre in Johannesburg from 7-9 November, 2018. 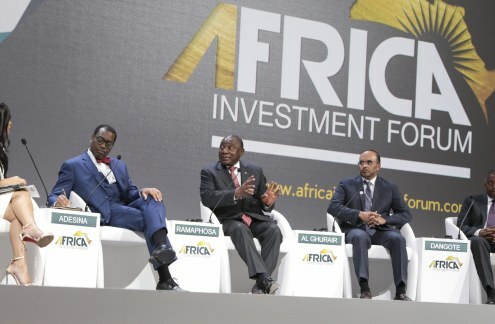 Day 2 opening plenary of the Africa Investment Forum taking place at the Sandton Convention Centre in Johannesburg from 7-9 November, 2018. (L - R) Julie Gichuru, Founder and CEO, Arimus Media Limited (moderator); Dr. Akinwumi A. Adesina, President, African Development Bank; H.E. Cyril Ramaphosa, President of the Republic of South Africa; Sultan Ahmed bin Sulayem, Group Chairman and CEO, Dubai Port World; Aliko Dangote, Chairman and CEO, Dangote Group. Day 2 of the Africa Investment Forum at the Sandton Convention Centre in Johannesburg from 7-9 November, 2018. 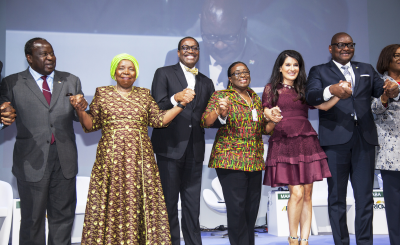 (L - R) Julie Gichuru, Founder and CEO, Arimus Media Limited (moderator), Dr. Akinwumi A. Adesina, President, African Development Bank and H.E. Cyril Ramaphosa, President of the Republic of South Africa. Day 2 of the Africa Investment Forum taking place at the Sandton Convention Centre in Johannesburg from 7-9 November, 2018. Day 2 opening plenary is an investment conversation between (L - R) Julie Gichuru, Founder and CEO, Arimus Media Limited (moderator); Dr. Akinwumi A. Adesina, President, African Development Bank; H.E. Cyril Ramaphosa, President of the Republic of South Africa; Sultan Ahmed bin Sulayem, Group Chairman and CEO, Dubai Port World; Aliko Dangote, Chairman and CEO, Dangote Group. 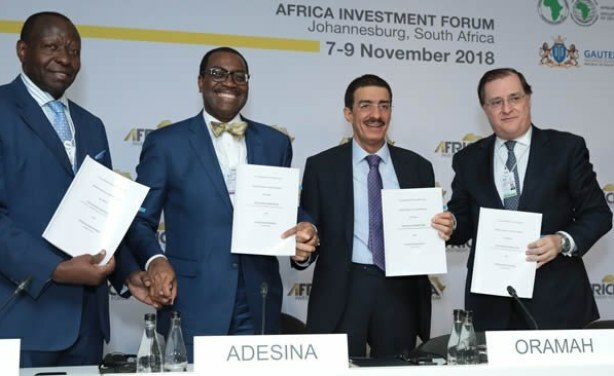 The African Development Bank alongside Islamic Corporation for the Insurance of Investment and Export Credit (ICIEC), African Trade Insurance Agency (ATI) and GuarantCo, on sing a Memorandum of Understanding for a Co-Guarantee Platform (CGP) on the first day of the Bank’s inaugural Africa Investment Forum in Johannesburg. Africa Investment Forum - Day 1 Wednesday, November 7. 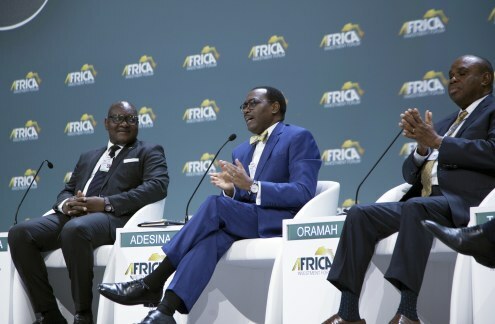 The African Development Bank's Africa Investment Forum (AIF) is taking place at the Sandton Convention Centre, Johannesburg, South Africa from November 7-9, 2018. 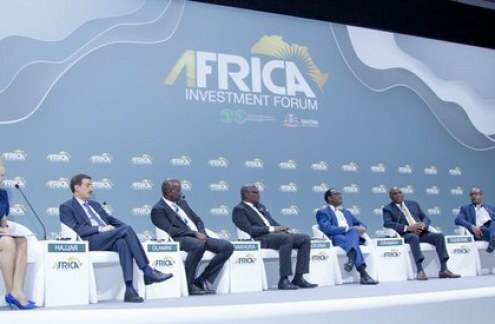 Lauded as "a game changer for financing Africa's infrastructure development," the forum will focus on structuring deals, screening and enhancing projects, attracting co-investors, and facilitating transactions to unlock Africa's multi-billion dollar investment opportunities. 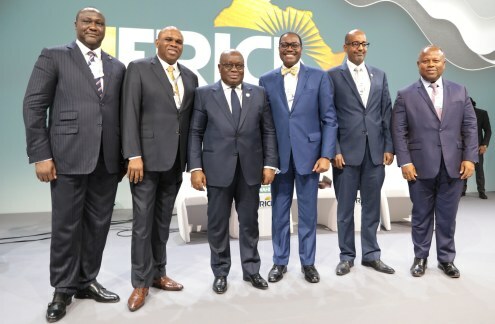 From left - CEO of Africa Finance Corporation, Mallam Samaila Zubairu; President of the Africa Export-Import Bank, Prof Benedict Oramah; President Nana Akufo-Addo of Ghana; President of AfDB, Dr Akinwunmi Adesina and President Trade and Investment Bank, Admassu Tadesse at the opening ceremony of the Africa Investment Forum in Johannesburg, South Africa. "Delivering As One for Africa" session at the Africa Investment Forum - - Africa Investment Forum - Day 1 Wednesday, November 7. Participants include Dr. Akinwumi A. Adesina, President, African Development Bank; Malemolla David Makhura, Premier of Gauteng; Patrick Dlamini, CEO, Development Bank of Southern Africa; Prof. Benedict Oramah, President, the Africa Export-Import Bank; Dr. Bandar M. H. Hajjar, President, Islamic Development Bank; Admassu Tadesse, President, Trade and Development Bank; Alain Ebobisse, CEO, Africa 50; Mallam Samaila Zubairu, CEO, Africa Finance Corporation and Bronwyn Nielsen, Anchor-at-large, CNBC Africa (moderator). "Delivering As One for Africa" session at the Africa Investment Forum - Day 1 Wednesday, November 7. Participants include Dr. Akinwumi A. Adesina, President, African Development Bank; Malemolla David Makhura, Premier of Gauteng; Patrick Dlamini, CEO, Development Bank of Southern Africa; Prof. Benedict Oramah, President, the Africa Export-Import Bank; Dr. Bandar M. H. Hajjar, President, Islamic Development Bank; Admassu Tadesse, President, Trade and Development Bank; Alain Ebobisse, CEO, Africa 50; Mallam Samaila Zubairu, CEO, Africa Finance Corporation and Bronwyn Nielsen, Anchor-at-large, CNBC Africa (moderator). 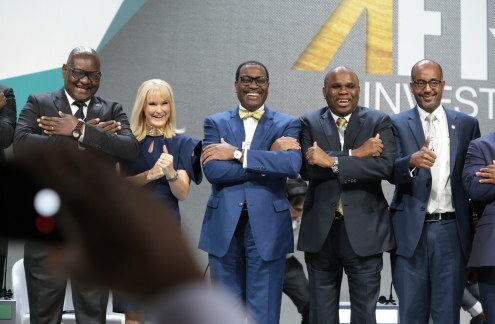 The African Development Bank's Africa Investment Forum (AIF) is taking place at the Sandton Convention Centre, Johannesburg, South Africa from November 7-9, 2018. "Delivering As One for Africa" session participants include Dr. Akinwumi A. Adesina, President, African Development Bank; Malemolla David Makhura, Premier of Gauteng; Patrick Dlamini, CEO, Development Bank of Southern Africa; Prof. Benedict Oramah, President, the Africa Export-Import Bank; Dr. Bandar M. H. Hajjar, President, Islamic Development Bank; Admassu Tadesse, President, Trade and Development Bank; Alain Ebobisse, CEO, Africa 50; Mallam Samaila Zubairu, CEO, Africa Finance Corporation and Bronwyn Nielsen, Anchor-at-large, CNBC Africa (moderator). The African Development Bank's Africa Investment Forum (AIF), a game changer for financing Africa's infrastructure development, is scheduled to take place at the Sandton Convention Centre, Johannesburg, South Africa from November 7-9, 2018.